If you're looking for a professional painting company look no further. We are the best, most trusted, and most affordable painters in the area. We paint both interiors, and exteriors. No job is too big or too small. If you're considering repainting your home or business we can help. Give us a call for more information or a free estimate. Our team of painters can help you transform the look of your home or business's interior. All you have to do is choose the color, or colors, you want to use and we will do the rest. When we're done we will do a thorough cleanup. We will give you step by step instructions on how to care for your newly painted interior. If you ever need a touchup in the future we'll be happy to come back. Painting the exterior of your home or office is an excellent idea if you are looking to increase that value of your property. A business with a newly painted exterior looks more professional. Your new exterior will attract new customers. The look of your home can be improved with a fresh coat of paint. It will not only increase the value but also the curb appeal. All of our painters are fully insured. They are responsible, respectful, and clean. Our painters are friendly, knowledgeable, and respectful. You can rest assured that they will do the job right. 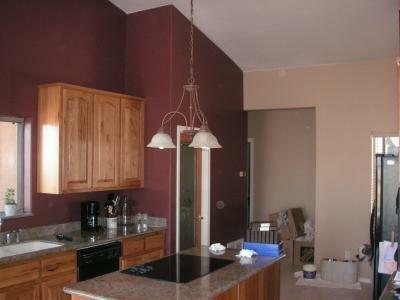 We offer high quality interior and exterior painting Scottsdale, AZ services. We want to help you transform the look and feel of your home or business. We can work with any budget. If you have financial concerns just let us know and we will assist you in any way we can. Your business is important to us. Contact us today to discuss more of your interior and exterior painting Scottsdale, AZ Needs.